The Harappans may be the most advanced ancient civilization that most Westerners have never heard of. They flourished in the Indus River basin on the Indian subcontinent around the same time the Egyptians were building the pyramids along the Nile and the Mesopotamians were digging irrigation channels fed by the Tigris and the Euphrates. The Harappans farmed the soil of the plains, soaked annually when the Indus and its tributaries flooded with rainwater and snowmelt. Their cities had fine architecture, massive water storage tanks, and sophisticated sewer systems. They traded by land and by sea, made jewelry and art, and were one of the first cultures in the world to develop a symbolic written language. They were probably the most egalitarian of ancient societies. Then around 3,800 years ago the Harappan civilization began to crumble. By 3,000 years ago it was gone. Archaeologists have turned up no evidence of a major war or epidemic, earthquake, or catastrophic flood. The reasons for the collapse have remained a mystery. 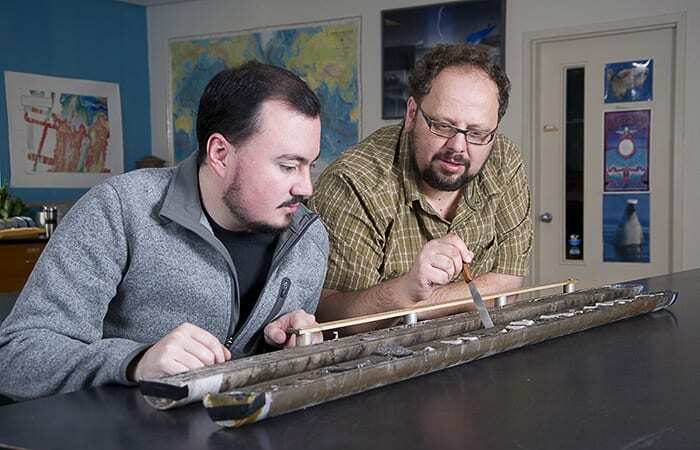 Now a team of scientists led by geologists from Woods Hole Oceanographic Institution (WHOI) has extracted subtle clues to reconstruct ancient environmental conditions. They suggest that a weakening of the monsoon doomed the Harappans. “This shows that people can be vulnerable to a slowly changing climate, whether it is natural or human-induced,” said Liviu Giosan, the WHOI geologist who spearheaded the studies. Yet, not all peoples living in the region suffered the same fate. Others, who lived a mostly hunter-gatherer existence in central and southern India while the Harappans were growing crops and building cities in the northwest, began to thrive. What spelled the difference? What lessons can we draw from their experience as we face climate change now? Still, much of the Indian peninsula is semi-arid because coastal mountains catch most of the rain carried by the monsoons. The Indus River basin, in the region that is now northwest India and southeast Pakistan, is especially dry due to hot winds from the Middle East that often block the monsoons. The river itself has abundant water, though; in addition to some monsoon rain, it also receives meltwater from the Himalayas in early summer. 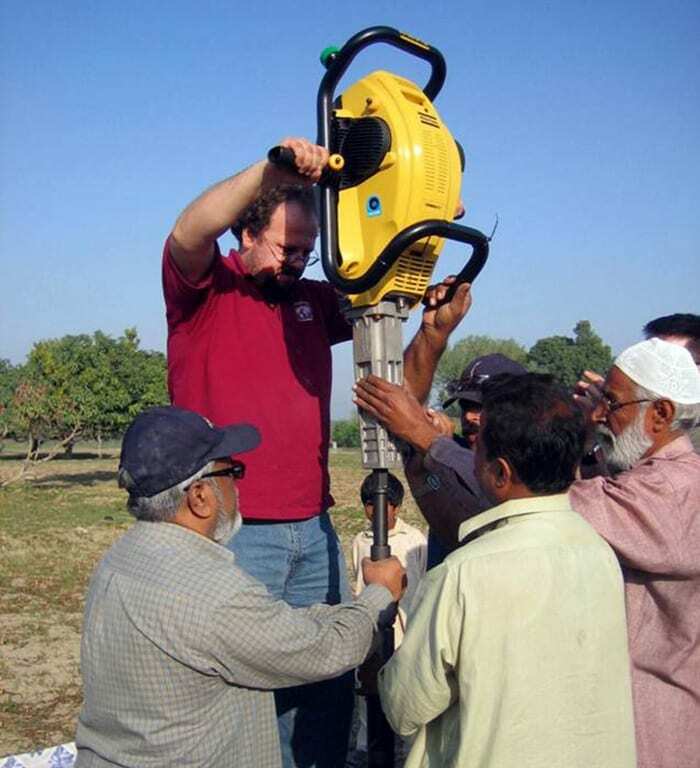 Giosan became fascinated with the region, the Harappans, and their fate when he and WHOI colleague Peter Clift, now at Louisiana State University, led an expedition studying the geology of the Indus River delta in 2002. Over the next several years, he delved into the prehistory of India to understand what archaeologists had discovered about the culture. He also began to think about how he could address long-standing questions about the region and its early peoples with new techniques from geology. By 2008, Giosan and an international team including Camilo Ponton, a graduate student in the MIT/WHOI Joint Program, were gathering geologic clues to reconstruct the ancient environment. He and Ponton suspected that the existing information on the Indian monsoons in ancient times didn’t tell the complete story. It showed that the monsoons have weakened during the past few thousand years, bringing less rain to the region than they did before. That work relied on data from cores extracted from the deep seafloor off the coast of India. These are long cylinders of sediment, much of which was delivered to the ocean by rivers and wind, piled up on the ocean bottom, and preserved a record of past conditions on land. But the cores used by previous monsoon researchers came from areas where so little sediment was deposited that a core 4 to 5 feet long included about 10,000 years of accumulation. Each sample of the cores with enough material to analyze represented 100 years or more. Ponton and Giosan thought that this sediment record might not capture significant events that happened on shorter time scales. So they delved into a core that offered more detail. Giosan helped collect the core on a cruise on the drillship JOIDES Resolution in 2006. It came from near the mouth of the Godavari River on the southeast coast of India. This was the perfect location for what the geologists wanted to do; because it is so close to the mouth of the river, sediments accumulate very fast there. In this core, 10,000 years is represented by about 26 feet of sediment. That meant they would be able to examine samples laid down during periods as short as 25 years. The location had other advantages as well. The Godavari drains a vast region of central India and reflects average conditions throughout the entire Indian peninsula. The area had also been home to hunter-gatherers who may have roamed far beyond the river basin in search of seasonal foods, at the same time the Harappans were building cities. Ponton said another key feature is that the Godavari receives no snow or glacial melt from mountains. All water running through it comes solely from rainfall, and so it accurately reflects the amount of rain that fell in its catchment area. Finally, fluctuations in the salinity of the Bay of Bengal provide a handy way to show how much water was carried by the river. Like all rivers that flow into the sea, the Godavari brings fresh water into a saltwater environment. That lowers the salinity of the sea, especially near the surface, because fresh water is not as dense as salty water and tends to float above it. After the monsoon season ends, the river delivers much less water to the sea, and the bay’s salinity rises. As a result, the Bay of Bengal has some of the biggest changes in salinity in the world’s oceans. Those changes are incorporated into the calcium carbonate shells of foraminifera, tiny planktonic organisms that live in the bay. When the foraminifera die, their shells sink to the seafloor, preserving in the sediments a record of seawater salinity changes. After cutting slices from the core, Ponton isolated the fossilized shells that were embedded in the sediment. He then used a mass spectrometer to determine the ratio of various isotopes of oxygen in the shells. That ratio told him the salinity of the water when the foraminifera were alive—which indicates how much fresh water the Godavari was putting into the sea at the time. Ponton and his colleagues found a striking pattern. 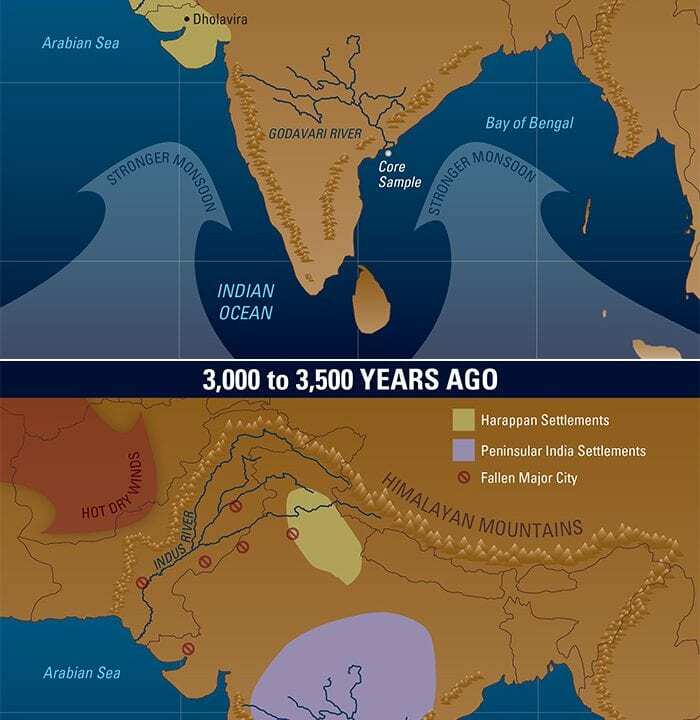 From about 4,700 years ago to the present, average salinity in the Bay of Bengal has risen slightly, indicating that monsoon rains have declined slightly. That was consistent with previous studies. But Ponton’s data show three distinct periods when conditions differed. From 4,700 to 4,000 years ago, salinity was essentially stable, with small deviations representing minor droughts or wet periods. 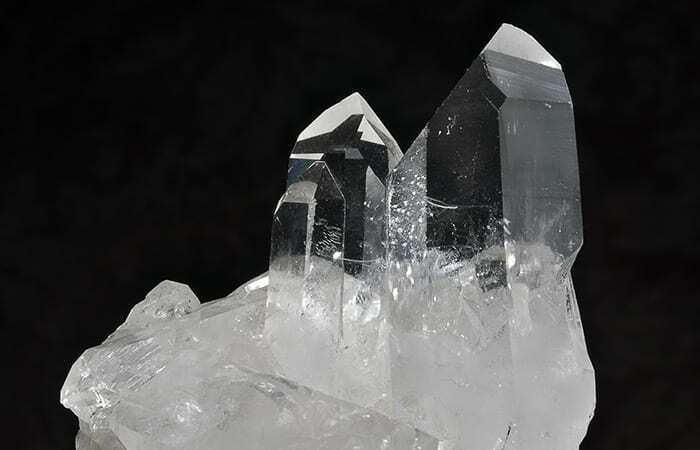 Between 4,000 and about 1,800 years ago, average salinity rose slightly, and the region suffered a few severe droughts lasting a decade or longer. Starting about 1,700 years ago and continuing to the 19th century, severe droughts lasting decades occurred much more frequently. The work was published in February 2012 in Geophysical Research Letters. But what difference did the droughts make, if average rainfall declined only slightly over the centuries? “If you have extreme droughts for a decade or even a few consecutive years, the plants in the region must be able to withstand long periods without rain,” said Giosan. More consistent monsoons, on the other hand, put less stress on vegetation, even if the amount of rainfall declines over time. Ponton returned to the Godavari sediment core and enlisted the help of former WHOI organic geochemist Timothy Eglinton, now at ETH Zurich, to find out whether vegetation in the region became more drought-resistant when the monsoon changed. Embedded in the sediment are waxes made by plants, which got washed into soils and the river and ultimately into the sea. Once in the ocean, the waxes stuck to particles of sediment and settled onto the seafloor. They also carry a signature of the general type of plant that produced them. Grasses, which are better adapted to arid conditions, aren’t too picky about which carbon isotope they take up from the atmosphere. Shrubs and trees, which tend to be very sensitive to drought, have a stronger preference for one type of isotope. By extracting the plant waxes from the sediment core and analyzing their carbon isotopes, Ponton was able to estimate the relative proportion of grasses versus shrubs and trees in the river’s catchment area. The researchers estimated that between 5,000 and 4,000 years ago, before the extended periods of drought began, vegetation in the river basin was 60 to 65 percent grasses. After that the proportion of grasses began to rise. By about 1,700 years ago it had reached 70 to 75 percent, and by 1,500 years ago grasses accounted for 80 to 85 percent of the vegetation in the region. “There has been a significant change in the vegetation—grasses became more widespread than shrubs and trees,” said Ponton. Giosan then wondered if the increasing aridification had affected the people in the Godavari River basin. Archaeologists had found that while the Harappans in the northwest were tilling fields and living in sizeable towns, the people on the Indian peninsula lived in small groups that hunted, gathered wild fruits, and sometimes engaged in “casual” agriculture that involved clearing a patch of forest, planting seeds, and then returning some months later to harvest the crop. They didn’t develop a more settled lifestyle until much later. But around 4,000 years ago, when conditions became drier and the shrubs and trees began to struggle, wild food was not so easy to come by. Casual crops no longer survived on monsoon rain alone. The people in the region responded by adopting sedentary agriculture, which required them to tend their plots throughout the growing season. About 100 settlements have been found dating from 4,000 to 3,200 years ago. By 2,800 years ago, the number had swelled to more than 1,000. Around 1,700 years ago, when severe droughts came even more frequently, the people began irrigating their fields with water they stored in cisterns. Driven by the drying of the monsoon, the hunter-gatherers had settled down and become farmers. Giosan knew that the drying they discovered from the Godavari sediment core also must have affected the Indus region and its people. But the western side of India did not offer the same kind of sediment core he and Ponton benefitted from in the east. He would have to find other ways of probing the geological record. He tapped a vast resource provided by NASA, the U.S. space agency. During the Shuttle Radar Topography Mission in 2000, NASA personnel had used radar to compile detailed topographic data about almost the entire planet. Giosan and his colleagues used those data to develop detailed topographic maps of the Indus, its tributaries, and their basins, revealing details difficult or impossible to observe at ground level. They detected the ancient boundaries of riverbeds and compared them with hundreds of ancient settlement sites identified by archaeologists. Their work was published in May 2012 in Proceedings of the National Academy of Sciences. Guided by the topographical data, Giosan, Clift, Mark Macklin of Aberystwyth University in Wales, and their team took land cores at choice locations along the rivers and determined the age of the sediments. They found that material near the surface of the floodplain is 2,000 to 3,000 years old, which indicated that the Indus has been relatively calm over that time, only rarely jumping its banks to carve a new channel—or to provide nourishing waters to the fields. 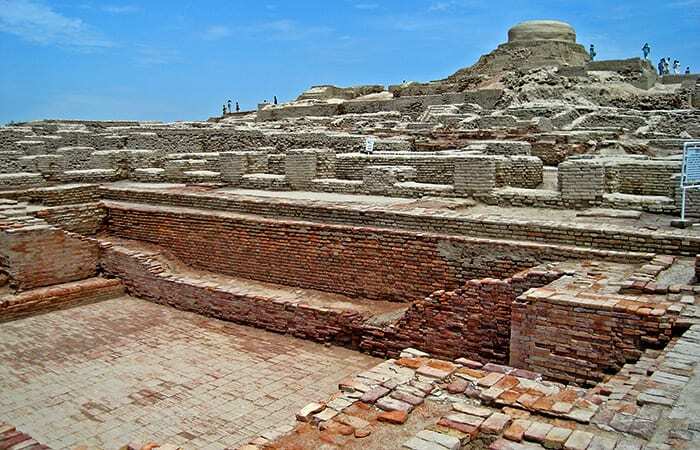 The scientists also gathered information on all Harappan sites that had been identified by archaeologists, both in the lower Indus valley and in the upper reaches of its tributaries. They compiled the most complete list to date of Harappan settlements and their ages and sizes. Then they compared the story told by those sites with the story revealed by their geological work. Before 5,000 years ago, the Indus and its tributaries were fed by strong monsoon rains and meltwater flowing out of the Himalayas. The rivers underwent raging floods every year that rendered their basins unsuitable for agriculture or permanent settlements. The ancestors of the Harappans lived in foothills west of the Indus plain where abundant monsoonal rainfall provided enough water to farm. By about 4,500 years ago, the weakening of the monsoon reduced the fury of the floods. The Harappans settled in the river valleys and took up inundation agriculture, relying on the benign floods that soaked the soil and recharged the groundwater. Despite a lack of rain late in the growing season, irrigation systems were not needed. 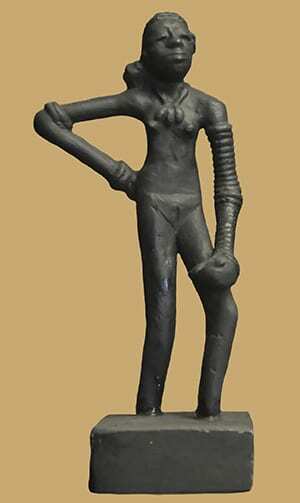 More than 1,000 Harappan settlements have been dated to that period. They occurred along hundreds of miles of the Indus, its five major tributaries, and beyond, toward the Ganges basin. Many of the sites were impressive cities with populations of about 20,000, very large for their time. But then came the more intensive monsoon weakening and aridification that Ponton had traced in his sediment core work and Giosan had seen in the changing behavior of the Indus. Inundation agriculture became difficult and then impossible. There was probably river flow due to snowmelt to support crops if the Harappans had developed more sophisticated irrigation technologies, but they did not do that. “They were living in a region that was already dry, and then when the floods subsided and became irregular, they couldn’t sustain their numbers,” said Giosan. 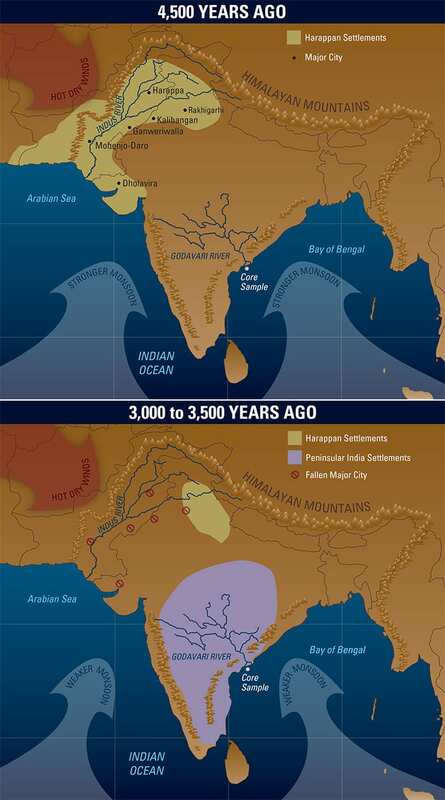 Around 3,800 years ago, at the same time the people in the Godavari basin were beginning to experiment with agriculture, the Harappan culture began to fall apart. The people gradually migrated toward the foothills of the Himalayas, where the peaks stripped the last vestiges of moisture from the weakened monsoons. New small settlements sprang up—but many more disappeared. Within a few hundred years, the number of Harappan settlements in the Indus basin dropped by half. None of the great cities survived. Neither did the technological and artistic skills that had characterized the culture. When the Harappan people dispersed to smaller settlements, they left behind their architectural prowess. They no longer traded with distant lands or made sophisticated art. They stopped writing. By 3,000 years ago, they had disappeared as a distinct culture. 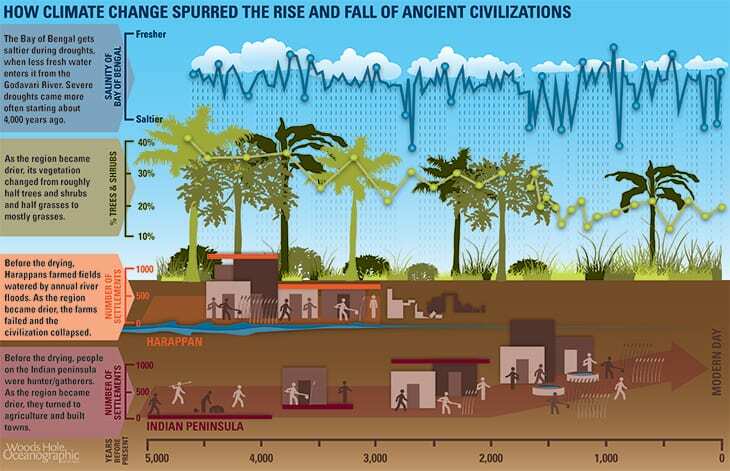 Although the changes in India’s monsoon occurred quickly on the geological time scale, they occurred much more slowly than present-day climate change. The cultures of the Indian subcontinent had hundreds of years to try to adapt to the drier conditions. The people of the lower Indian peninsula developed new technologies and new ways of living, and survived. The Harappans in the west, despite all their previous accomplishments, did not. The two cultures “were affected in different ways by the regional patterns of the same climatic phenomenon,” said Giosan. He thinks what happened to the Harappans should be viewed in the context of societies that came before—and after. “In Mesopotamia, when aridity struck, they made a technological advance: They started to use irrigation. In Egypt, the same,” he said. “The Harappan people, instead, had a choice. They had a place to migrate toward keeping their way of life.” But they did not, probably could not, anticipate that their way of life would not survive that migration. And what are our options, as we begin to grapple with the consequences of climate change and the need to provide food and water for a burgeoning human population? This research was funded by the National Science Foundation, Woods Hole Oceanographic Institution, the Leverhulme Trust, the University of Aberdeen, and Louisiana State University. It was done by international teams of scientists from India, Pakistan, Romania, Switzerland, the United Kingdom, and the United States.